My skin may be a royal pain, but I’ve always had pretty resilient hair. Sure, I’ve thrown it through the ringer and used Sun-In, straight bleach, dyed it a shade from black more than I care to admit, balayaged, highlighted, blown out, curled, used way too many products and much too strong hairspray through the years, but it always stays good to me… for the most part. Over the past five years, however, I’ve gotten into a gentler routine that keeps my color-treated hair [what I think] healthy looking. 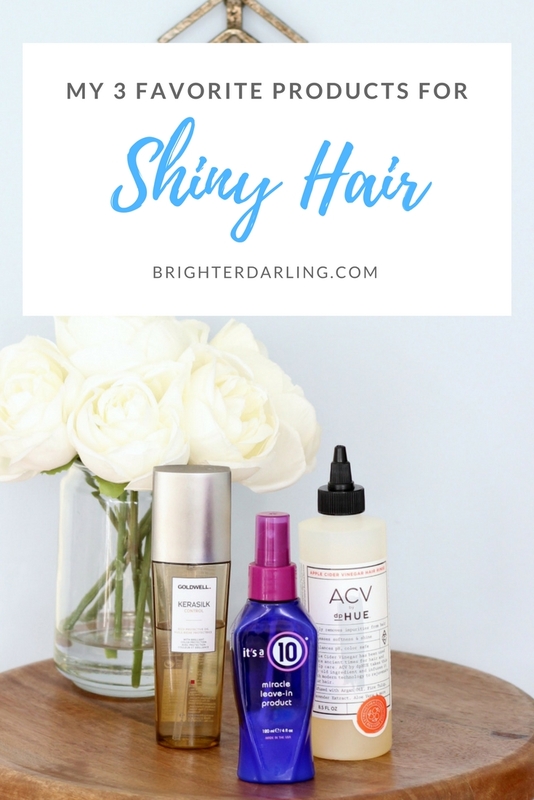 If you want to know my favorite 3 products for shiny hair, continue reading. 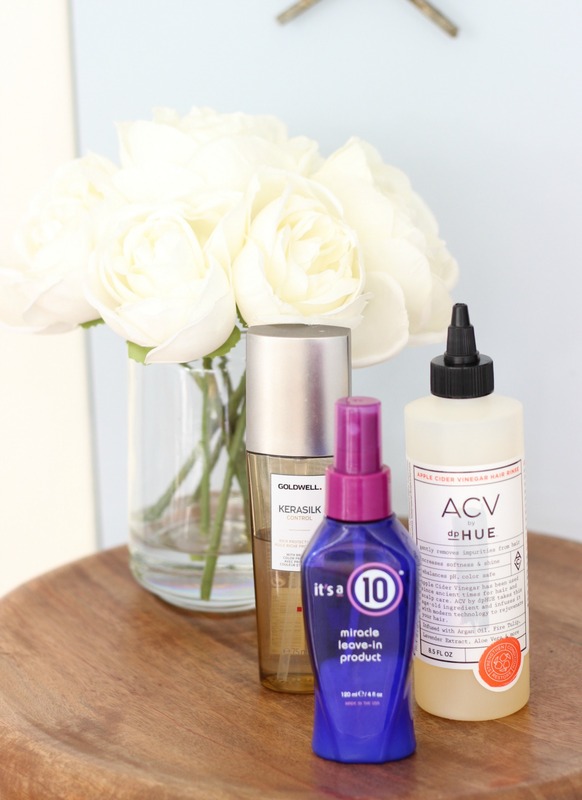 Everyone has seen the It’s A 10 Miracle Leave-In at their local drugstore or Ulta. For the longest time, I thought it was an overpriced leave in spray and couldn’t understand why anyone would buy it. But one day back in ~2011/2012, I bought a bottle on a whim and have never gone back to thinking it was an unnecessary product. If you have dry, damaged or just knotty hair, this is a must. try. I swear, out of all the products I mention today, this is the #1. It’s A 10 keeps my hair soft, easy to brush through (thus reducing damage, flyaways and overall frizz), bouncy and – of course – shiny. I spray this throughout my hair prior to brushing before blow drying and will never be without it. It’s A 10 make different versions and I’ve tried them all except the “Lite.” As a blonde, I really enjoy their violet-hued ‘blonde’ version, but the original is my fave. The keratin version didn’t seem to have much of a difference to me. After putting my hair into a state of total chaos back in ~April 2017 (went to a new hairdresser who destroyed my hair and my bank account), Melannie Millan from Uptown Salon in Houston worked her magic and fixed me up. Because of intense corrective color treatments to fix the mess, she recommended this Goldwell oil in place of other oils I had been using because I told her I didn’t really find the ones I had used to be doing much. I LOVE this hair oil because it is lightweight, maintains life/bounce to my hair (you’ll notice I talk a lot about wanting bouncy hair… this is because my hair is thick and heavy), gives it a smooth finish and bonus points for smelling AH. MAZING. I use one pump before blow drying mixed with this product, and one pump after curling or flat ironing. …Plus, I like that it’s almost-clear which is helpful when you’re a brunette-gone-ash-blonde. Many gold-toned oils make me nervous they’re giving my hair a brassier look. A new-to-me product and brand, dp.hue sent me their Apple Cider Vinegar Rinse and I immediately was intrigued. 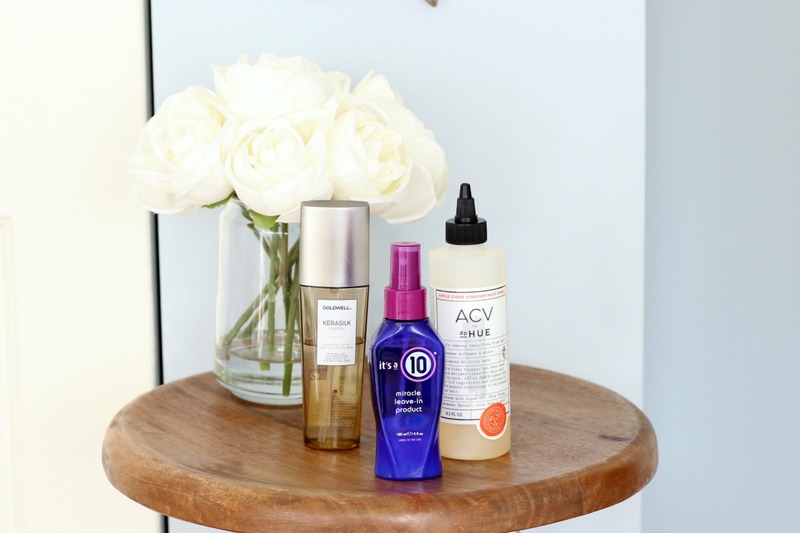 At first, I wondered if vinegar would be damaging to my color treated hair, but after reading up on the ingredient, it’s actually quite safe and good to use as a gentle, deep cleansing detox for product build up. The dp.hue formula isn’t just apple cider vinegar, it has a lovely blend of oils to help hydrate as it cleanses. You use this in place of shampoo and/or conditioner in the shower. I use the nozzle applicator to apply it through my wet hair and massage my scalp – adding more of the rinse to my ends. It gently suds up – but don’t expect a full lather. Leave it in your hair for 3-5 minutes, then rinse. When you blow dry your hair, you’ll notice how shiny and lightweight (but soft) it is! I like using this once a week or every other week. With blonde hair, it can be hard to get shine, but this rinse really helps it shimmer in the light and I’ll definitely be repurchasing the dp.hue apple cider vinegar rinse when I finish my first bottle. What products do you like to use to keep your hair feeling its best? Let me know if there are any I should add to my arsenal to combat the extreme temps this winter in the northeast. Share with a friend if you think they’d find this helpful. I appreciate your support so much! "Charlotte Tilbury Instant Eye Palette Tutorial [YouTube]"
"Jaclyn Hill Morphe Palette Looks, Review + Naked HEAT Comparison"